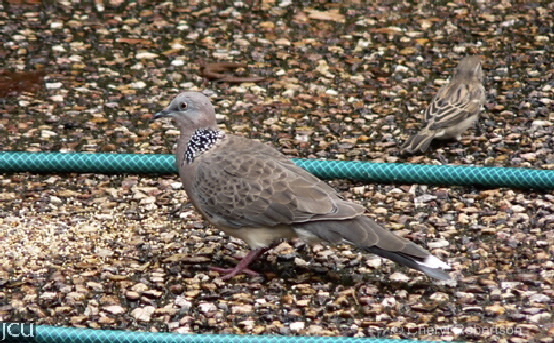 This dove can be found in urban areas particularly where there are grass seeds, the body is basically brown to grey often with a mauve to pinkish tinge. The wings, back and tail are mottled dark and light brown, and on the back of the neck there is a patch of black with white spots, underparts are pale brown-grey with a pinkish tinge. Legs and feet brown, eyes black, bill dark. Raises and lowers tail on alighting.